Thank you for choosing to shop with us and considering this beautiful print, Mail Pouch Barn Print by Billy Jacobs for your home! 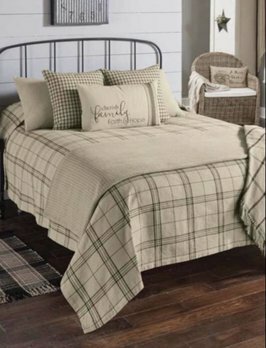 Bring the cozy farmhouse style to your country home with the Fieldstone Plaid Queen Black Bedspread. This Coverlet blends the colors of Oatmeal & Black Plaid. Dry cleaning is recommended to preserve color and to prevent shrinkage. Enjoy the beautiful Primitive Art of Billy Jacobs like "Flag Barn" in the size that best fits your home. Our Frames are made of poplar wood painted black and assembled. Styles come in your preference of Round 1 3/4 inch or Deluxe (Flat) 2 1/8 inch. Nothing says Fall like pumpkins and the glow from the Autumn Harvest Pumpkin Candle Sleeve will set the mood. The candle sleeve is made in the USA. 6 watt bulb and the base of your choice (Antique White, Chocolate & Black) are all sold separately. 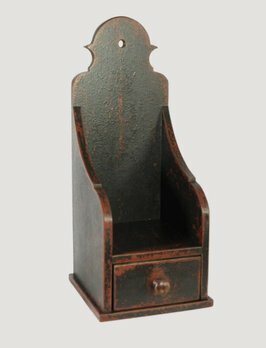 The authenticity of Colonial was captured with this Wall Sconce with Drawer! Add a candle and bring a warm glow to any room. The stunning black and red finish is beautiful. Made of poplar wood in the USA. From the workshop of Kenneth James.